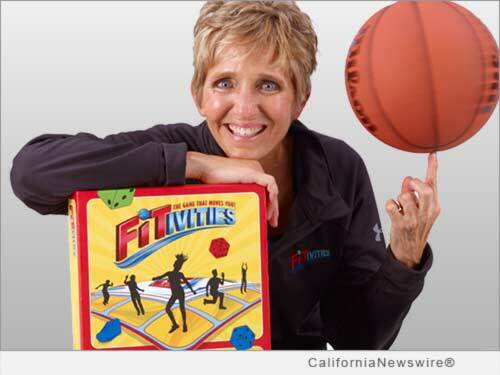 CORONA, Calif. /California Newswire/ — CORONA, Calif., Sept. 16, 2014 (SEND2PRESS NEWSWIRE) — Sandy Spin Slade, Inc., the company that created Skillastics(R), the successful series of games for the educational market, is excited to announce the launch of the indoor/outdoor family fitness game FITIVITIES(TM). A fast-paced game where all ages and abilities can incredibly play together at the same time! Players roll, spin, move, and experience controlled frenzy that's just exciting and fun. FITIVITIES(TM) is the next step in the evolution of classic group games like Twister(R) and Pictionary(R). Destined to become this generation's classic, FITIVITIES(TM) combines all the popular aspects of classic board games, but includes physical activities adaptable to almost any age while engaging all in simultaneous team play! Creator and life-long fitness advocate Sandy "Spin" Slade exclaims: "I truly believe that if we want to change the way society views physical activity, it has to start in the home and it has to be fun. I have combined the best qualities of Skillastics with the perfect mix of team play and excitement that naturally could be adapted to fit all age groups or any combination of ages." Slade evolved from a teenage basketball-spinning phenomenon to an arena-rousing NBA Halftime sensation, performing and entertaining around the world for more than two decades. Her Skillastics(R) game series continues to blaze trails, moving over 10 million student's in 20,000 educational settings across the nation and around the world. FITIVITIES(TM) adds to the newest layer to Slade's passionate mission – transforming physical activity into the fun, group experience for ALL ages. For more information and to view videos of all ages playing FITIVITES(TM) visit: http://www.fitivities.com/ . * Video Link: Phenom Behind Fitivities – http://youtu.be/zNUpXimPuYs .